This year’s “hot” Christmas toy? The Hatchimal, a cheaply assembled bauble of petroleum byproducts. This Christmas morning take the opportunity to talk to your kids about the recent stability in the oil refiners ETF. Can it last? All of us are ultimately buffeted by forces far beyond our control. The majority of men say they’d most like to receive cash for Christmas, while a majority of women say they’d rather receive a present. Once you’ve identified the exact amount of the cash gift you’re likely to receive, it’s easy to purchase a present for her that costs less than the amount you’ll be getting. A mere $10 difference in these costs will turn into $100 over the course of a decade, and $1,000 in a century. Over the course of a millennium you’ll be able to pocket $10,000. Is this how the “patriarchy” was originally invented? An interesting topic for researchers to explore, but beyond the scope of our discussion here. If Jesus had practiced this tactic, his male descendants could have saved more than $20,000 by now. Does this all tie in to the history of The Crusades? An interesting topic for researchers to explore. Many celebrities have large Christmas trees. Use this information to blackmail celebrities. I’ll leave the details to you. You want to impress me, Amos? This is your chance. A Christmas tree farmer found and returned a wedding ring that a man shopping for a Christmas tree had lost 15 years ago. A Christmas miracle? Not quite—these men live in New Jersey. Haha. The joke is that New Jersey is hell on earth, and have you seen many miracles in hell? Only a miraculous flaming spear through the nuts, maybe. One trend to discuss this year is the “co-working Christmas party,” where many firms that share the same offices come together for a holiday bash. Well we’ve discussed it now. 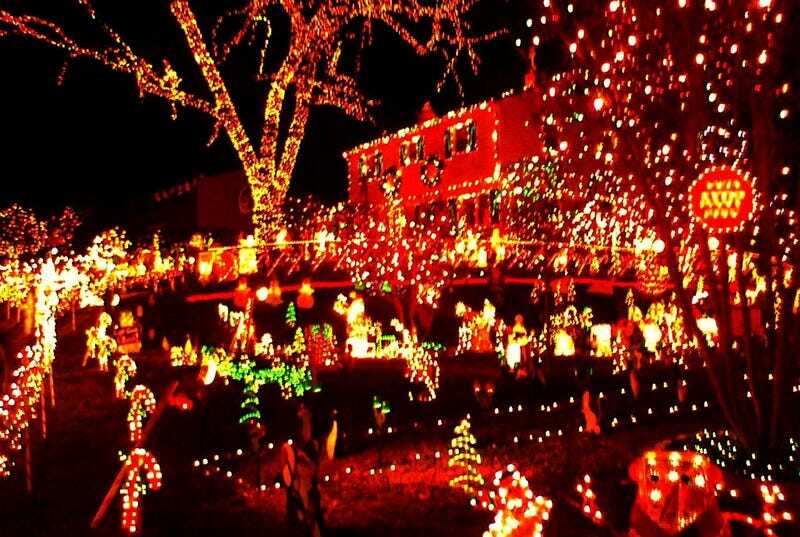 If you want to see a collection of over-the-top Christmas lights from across the U.S., click here. Better yet, make it a road trip—and I’m riding shotgun! Before we go, lets stop at the local pharmacy to pick up some egg nog, along with my prescriptions and some shaving cream. I’m all out! Then we’ll swing by the grocery, to get eggs, black beans, American cheese, almond milk, Grape Nuts, and other holiday staples I keep in my kitchen all year long. Then take me to the bank to deposit a check and to the barber shop to get my holiday trim. Then take me home. A squirrel was caught on tape stealing 150 Christmas light bulbs in just 24 hours. Cute? What if you learned that those Christmas lights were the only presents that 150 kids were going to get? I bet you’d kill that squirrel with your bare hands—only to find that I had just made the whole thing up. Distraught, you decide to attack me. But I’m only the messenger. Christmas shoppers in Ireland are being warned to remain vigilant, because every year lots of things are stolen from cars parked at shopping centers during the holiday season. “So ya daen’t park ya car in the bloody shapping sunter, den!” I scream. A man taps me on the shoulder discreetly: “That’s not what an Irish accent sounds like at all,” he says. “Even if it was, your grotesque reaction is uncalled for. You’re embarrassing yourself.” As he speaks, his belly shakes like a bowl full of jelly. “Hello, St. Nick!” I cry. It turns out he was actually my parole officer, but the resemblance (minus the beard) was uncanny.